Progress has been embarrassingly slow on these chaps, in part because real life has been busy but also in part due to a not-very-sensible approach. I tried tackling too many figures at once and so lost enthusiasm around the base coating stage. Eventually I got some to the wash and highlight stage and it all got better from there. Still basing to do, unfortunately. Plus they still need their standard bearer, but I'm rather daunted by the need to build him an arm! I'm pleased with the way Erny's orcs mix in with the metal ones, although the right hand end of each rank is at a premium to give space to those enormous scimitars! 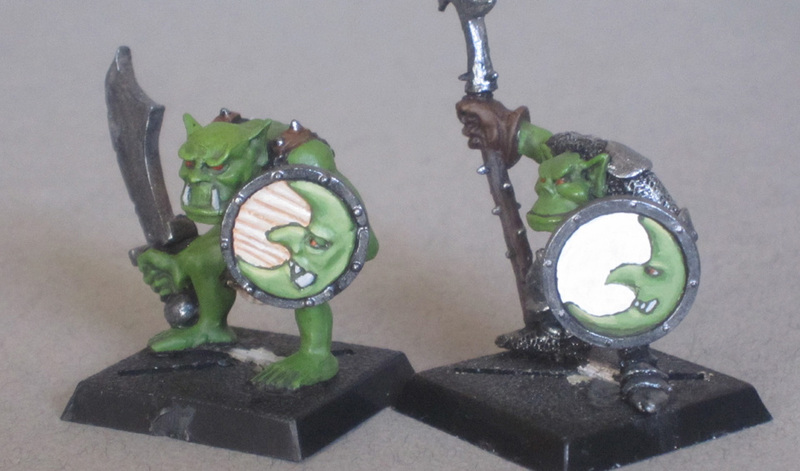 I also need to give credit to Jeff McC for the colour scheme - for years I avoided painting orcs in greens and browns which rather limited my options. Thanks to some of the examples I've seen on here I now begin to appreciate how to give even irregular units a vaguely uniform overall look while still keeping variety in there. Still plenty more to do to make these chaps into a decent sized unit, but first I'm going to divert onto some other figures including the hobgoblins. This is a gret inspiration....I plan on having a big green skin painting push this fall...reviewing threads like this will get me all fired up! I know sometimes it's a slog but keep plugging along and the results will add up to something quite impressive. @ Blue in VT - thanks, glad you like them. As you say, however slow, at least I'm moving forward! @ Paul - Yes, absolutely. The one thing my lads like better than a good fight is a good fight against another army. Ideally one that's surprised, hung-over or otherwise incapacitated! When's good for you - my Friday's are pretty clear except for 16th May? Progress is being made though! and their a lot better looking in the flesh as it were; so, I would worry too much about how unkindly the dice appeared to roll for them last night - they gave a pretty good showing for themselves once the squabbling ceased. Sorry to say I couldn't open your zip file, so you're going to have to post the pictures I'm afraid. Three and a half years later I'm up to 1000 points of painted chaos. Not an impressive painting speed by the standards of anyone here, but I'm glad to get there...! I love to see an old project thread revived!